As you approach Heidelberg from the city centre, the first thing that greets you is a giant dog house, covered in colourful polka dots and stuffed toy animals, this is your entry into the world of Tyree Guyton. Primarily a painter and sculptor, Tyree Guyton has also been described as an urban environmental artist. He has waged a personal war on the urban blight of Detroit’s East Side, transforming his neighbourhood into a living indoor/outdoor art gallery. 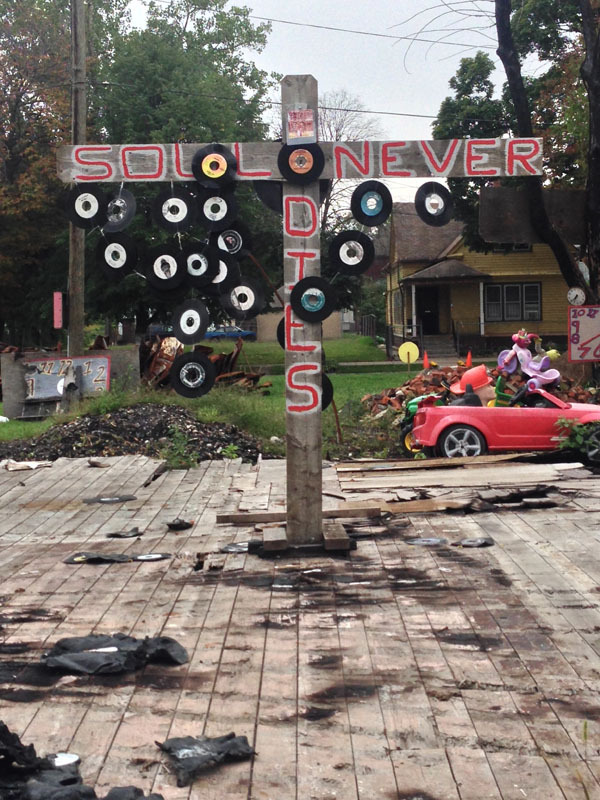 Through his art, Guyton has drawn attention to the plight of Detroit’s forgotten neighbourhoods. 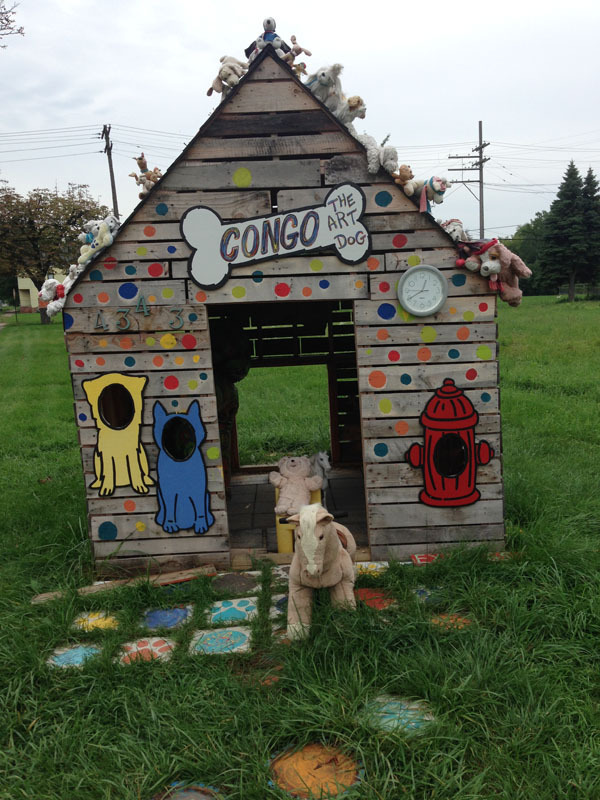 So for example, the dog house is designed to promote two local school arts projects. 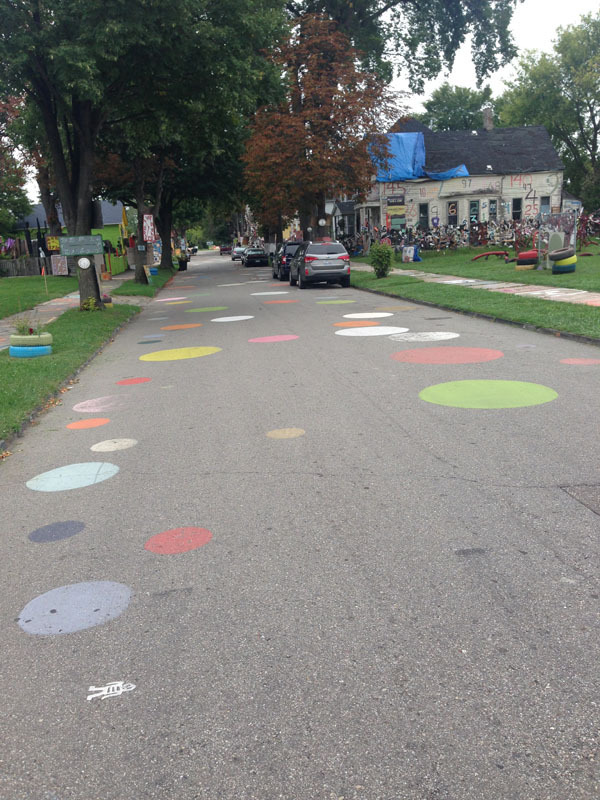 As you look down the street of colourful polka dots there you see a world of decorated houses, sculptures, stuffed animals, thousands of shoes and a pink SUV half-buried in the ground, with plants growing out of it. 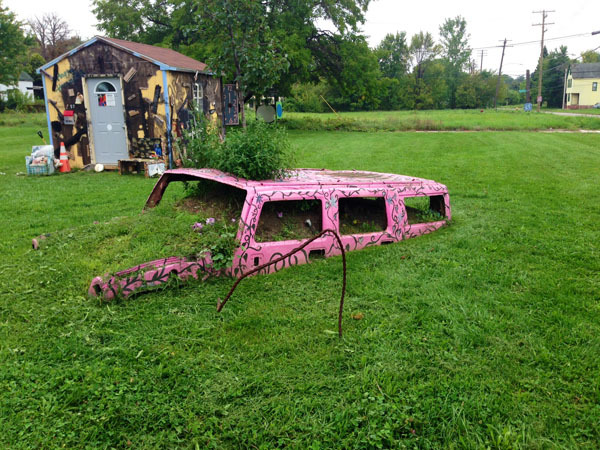 The pink submerged “Hummer” is meant to remind the observer of global problems associated with conspicuous consumption and the inequality of wealth and opportunity in poverty-stricken Detroit. 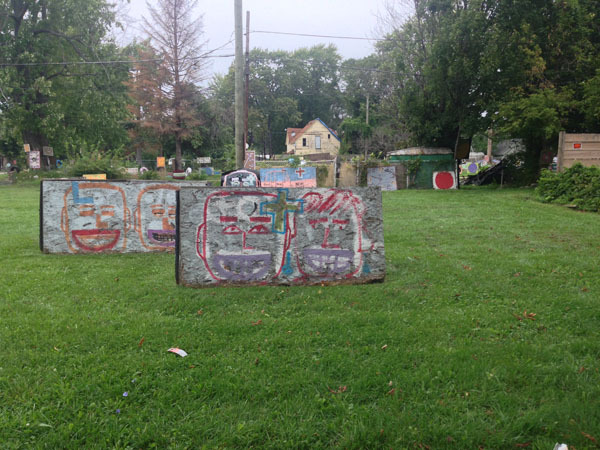 The Heidelberg Project was created in 1986 by Tyree Guyton and his grandfather Sam Mackey, who died in 1992. It is in part a political protest, as Tyree Guyton’s childhood neighborhood began to deteriorate after the 1967 Detroit riots. Guyton described coming back to Heidelberg Street after serving in the Army: he was astonished to see that the surrounding neighbourhood looked as if “a bomb went off”. The project was also a protest against the authorities who allowed these neighbourhoods to slide into ruin and an attempt to replace squalor with beauty. Detroit’s political establishment hates it and the town hall partially destroyed it in 1991 and again in 1999. 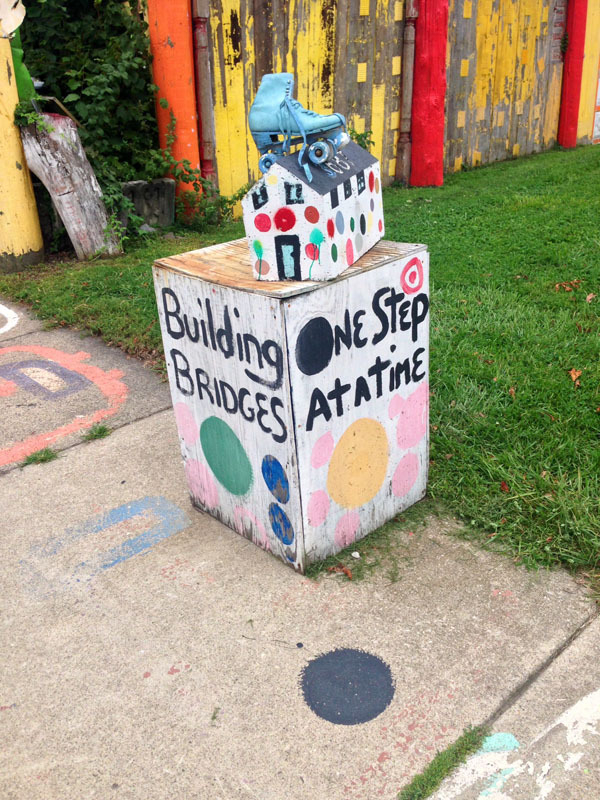 Each time, the Heidelberg Project came back stronger. Over the last six months, arsonists have twice attacked the site, burning down several painted houses. Sadly the House of Soul was burnt down – this monument has taken its place. The project won international recognition after HBO made a documentary, Come Unto Me: The Faces of Tyree Guyton, and in 2007 Guyton’s work was included in the French documentary Detroit: The Cycles of the Mental Machine, featuring Techno artist Carl Craig and Underground Resistance member Mike Banks. Like all great art it can be viewed on its own artistic merits, but much of the work has a political message. Grandpa Sam often painted polka dots because they resembled one of his favorite snacks – jelly beans. 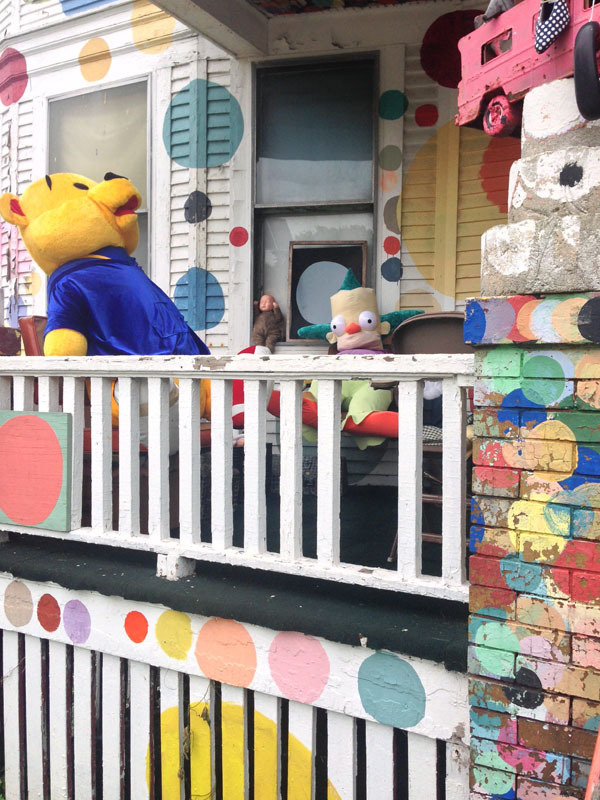 For Guyton, the diversity of jelly beans represented racial harmony and became a common theme of the Heidelberg Project. 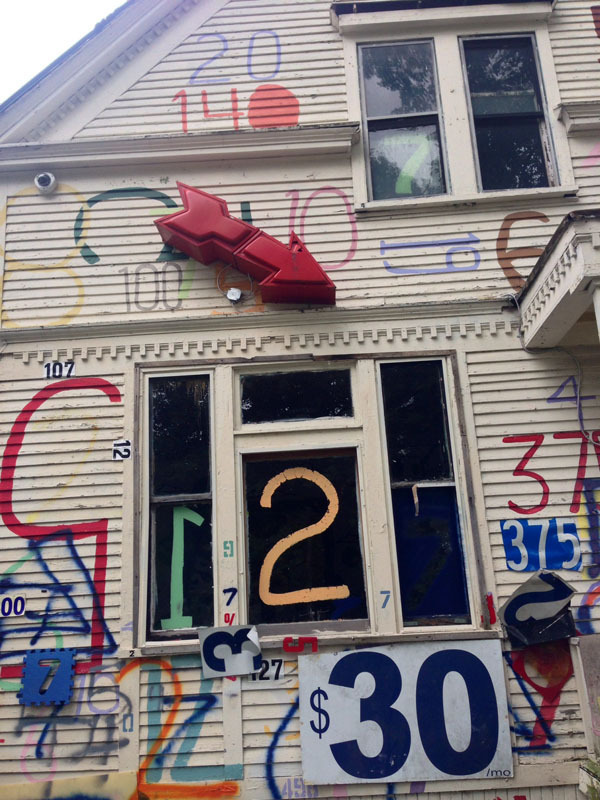 Again the Number House is designed to draw attention to the government’s inability to take care of people and to heal the deep scars that run through Detroit following the 1967 riots. Guyton also began to hang shoes from trees and houses after his grandfather recounted stories about lynchings in the south when “all that could be seen were the soles of shoes” of the victim. 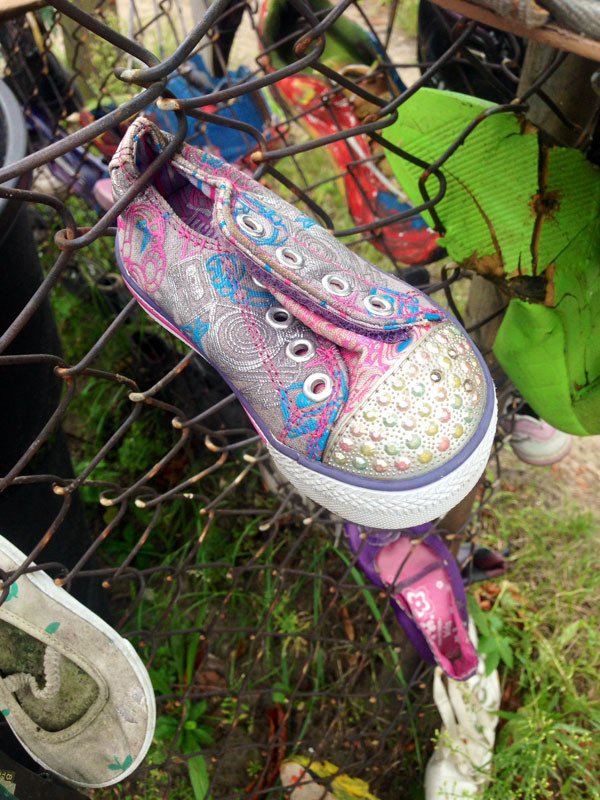 One chilling fact is that friends and family of murdered Detroiters leave shoes and tie them to the railings – they are a shocking reminder of the daily violence of the city. Beacon for Broken Health Care was one such work. Complete with a written statement, broken receptionist desk, hospital bed, crutches and supplies this work pointed out the need for preventative medicine and affordable and accessible primary care facilities for all. Many vistors say the thousands of stuffed animal toys give the area a “creepy feel”. I think that’s intentional – it is meant to be a statement against violence to children. A smaller mural is a statement about health care and hundreds of other pieces are just colourful installations.